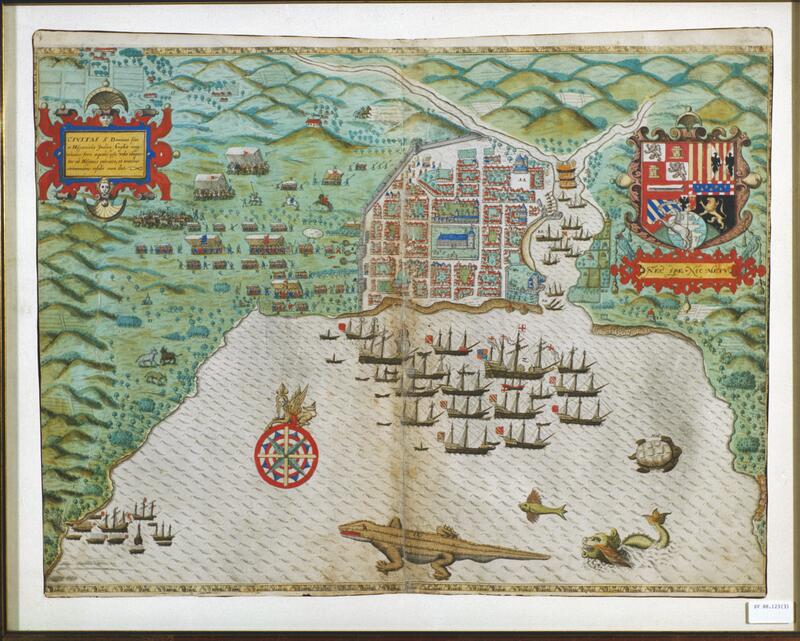 This image depicts a pirate attack on the city and port of Santo Domingo. The city is shown as if seen from above, with its grid-plan blocks surrounding the main plaza and cathedral. The encircling hills appear as a pattern of rounded, but undifferentiated forms. The over-sized animals swimming in the foreground did not actually appear in the waters outside the port. They were reworked from earlier images of the Americas known in Europe. The emblem at left identifies the city as Santo Domingo. The oblique view of the city reveals its heavily fortified exterior walls at left and the river Ozama, which flows into the Caribbean and formed one of Santo Domingo’s borders. The center of the city is dominated by the cathedral, the first built in the Americas. This map shows the conditions of the city’s siege under the command of Sir Francis Drake—a famed English pirate. A fleet of ships, with their flags proudly displayed, blockades the port. The prancing horses outside the city draw upon stylized images of military parades. Drake camped out in the Cathedral in 1586 while he held the port hostage until the Spanish crown paid a ransom for its release. While the image shows Santo Domingo as a well-built city, after Drake’s sacking and burning, it was not. This is therefore an idealized image of both the attack and the urban space where it transpired. At the bottom of the map, an alligator, a turtle, a flying fish and a sea serpent appear in the bay, helping to evoke the otherness of the Caribbean for European readers. Across the alligator’s back, a vertical crease indicates that the image was folded in half to fit into a book. Baptista Boazio (active 1588-1606) was an Italian draftsman who lived in London. His images of Sir Francis Drake’s Caribbean voyage draw from earlier pictorial representations of the Americas and written descriptions, not his own eye-witness experiences. The printed engraving is likely to have been executed by a master engraver following Boazio’s design. The image is a book illustration, made of ink and color on European paper, and measures ca. 40 x 55 cm (ca. 16 x 21.5 inches). The engraving was hand-colored, and one of several made by Baptista Boazio of Spanish port cities. Others include St. Augustine and Cartegena. The letters on the map correspond to a key, written in Latin (but not included in the image here). This image was published in a Latin edition celebrating Drake’s exploits in the Americas. 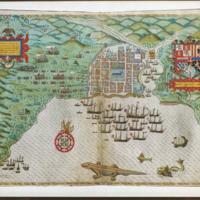 It was the first known print showing the Caribbean port of Santo Domingo to circulate widely in Europe. The sacking of Santo Domingo by Sir Francis Drake was a disaster for resident Spaniards. The local city council sent letters to the Spanish crown, describing the damage and asking for help in reconstructing their city. One such letter appears in the library of Vistas. The publication of this picture in 1589, followed quick on the heels of the English defeat of the Spanish Armada. As with the published images of other Caribbean cities that Drake attacked—Cartegena (Colombia), San Agustín (Florida), and Santiago (Cuba)—this picture would have evoked not only “the Caribbean” but also would have underscored the competition for American wealth among European powers. Today, the scene continues to show how European political rivalries found expression in visual culture focused upon Spanish America. Andrews, Kenneth R. 1978. The Spanish Caribbean: Trade and Plunder, 1530-1630. New Haven: Yale University Press. Lane, Kris E. 2016 . Pillaging the Empire: Piracy in the Americas, 1500-1750. New York: Routledge: M.E. Sharpe. Sir Francis Drake: An Exhibition to Commemorate Francis Drake’s Voyage around the World, 1577-1580. 1977. London: The British Library.